from a wide variety of existing ac or dc power sources. Security or surveillance cameras are frequently located significant distances from monitoring or recording equipment. 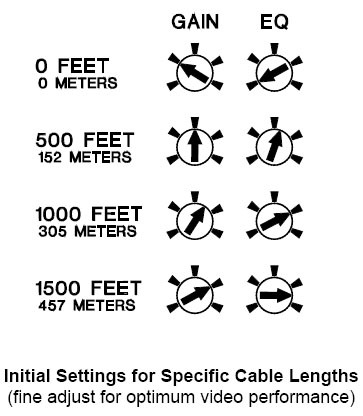 Cable losses produce a decrease in the overall video level. High frequency attenuation in the cable produces additional loss of higher frequency components of the video signals. These combined losses result in degradation of color signals, and decreased resolution in monochrome images. The TX-VLA1 can be located right at the camera and adjusted to compensate for both losses. 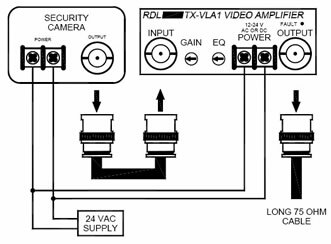 GAIN and EQ may be adjusted on the TX-VLA1 to drive video cables as long as 2000 feet (600 meters). 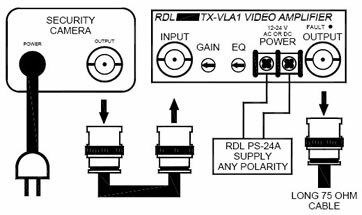 The TX-VLA1 is supplied with a chart showing recommended beginning settings of GAIN and EQ for various lengths of cable. The settings may then be further fine tuned for an optimum, high-quality video transmission.